In this day and age, you need to be able to provide your clients with a reliable mobile Forex trading solution. 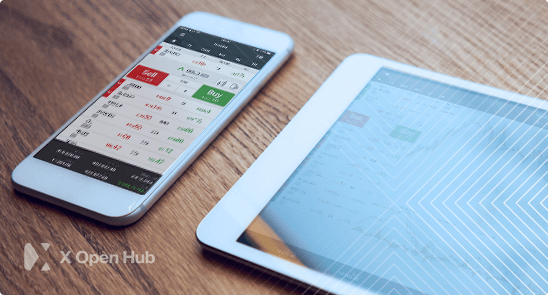 Now, thanks to xMobile, X Open Hub’s mobile app and xTab, our tablet app, your clients can take advantage of our cutting edge trading platform on the move from their Android and Apple devices. xMobile and xTab give users full access to their account and the trading platform itself through our user friendly, easy to navigate interface. The interface is divided into several modules which mirror the functionality offered by xStation, our web based platform. This allows users to execute trades on our full range of financial instruments, modify their open transactions and access their full trading history, all from within the app. And because settings are saved to our cloud server, your clients can rest assured that any activity will be logged across all our trading platforms. xMobile also gives users the option to add the instruments they trade most frequently to a favourites list, making navigation on the smaller screen even easier. But there’s no point in being able to place a trade if your clients don’t have access to the necessary resources. So we’ve designed our apps to allow users to monitor live prices and trends through a full suite of advanced charting and technical analysis tools. This helps users to plan their trades on the go by giving them access to the same range of information that is available on the web platform. Users can also reorient their mobile and tablet devices to show both a portrait and landscape view, allowing a clearer visual representation of the data on the charts. The apps provide the latest news and analysis to help your clients make effective trading decisions on the go. Users can access our advanced economic calendar to monitor the daily events that can have such a big impact on the money markets. They can also stay up to date with the key fundamentals, including economic indicators and macro data, as well as keep an eye on live commentary about the state of the markets. And for those who are new to our platforms, we provide a host of educational resources including a series of video tutorials explaining how to get the most out of the app. The money markets can move in the blink of an eye so speed of execution and stability are key for whatever platform your clients are using to trade forex. So when we developed our mobile and tablet apps, making sure that these two attributes were taken into consideration was our top priority. Our developers worked hard to ensure that the apps provide the same level of reliability and performance as our web platform so you can rest assured that your clients are enjoying the premium trading experience they expect. Mobile trading isn’t just a fad, it’s here to stay. So if your clients trade Forex on the move, make sure they download xMobile and xTab today. Both apps are available from the Apple Apps Store and Google Play at no extra charge.